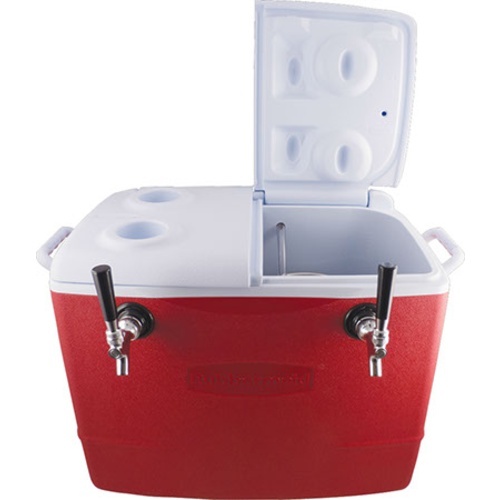 Jockey boxes are portable dispensing systems used to cool beer as it travels in-line from your keg to the faucet. Our jockey box design is especially useful for the homebrewer! You can take it camping, tailgating, or just pull it out when the gang is over. It’s not too heavy to lug around, it’s sturdy, and it’s easy to clean! 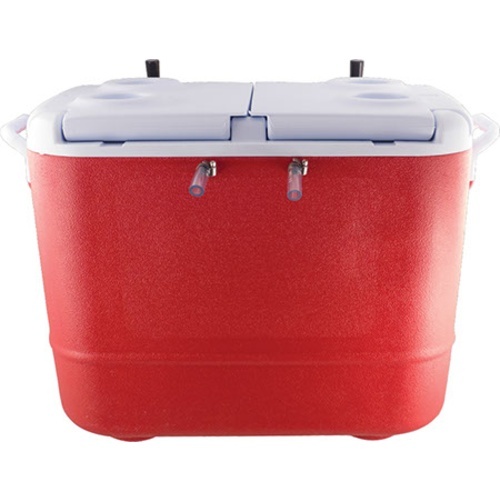 Add ice water to the cooler, & your beer will pour cold for hours! Our draft system cools a greater volume of beer, and cools it faster. The coil will hold approximately 33 oz of beer at a time. Our larger diameter coil offers less resistance, which lets you push the beer with less applied pressure. 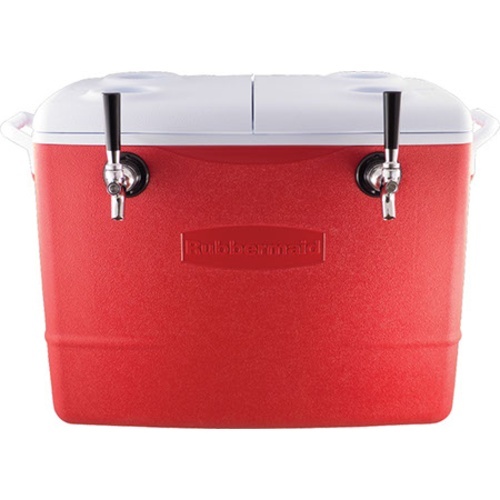 Our boxes require about same pressure you use in a typical kegerator, making it easy to take a keg from your kegerator to the picnic and back without having to worry about the carbonation level or serving pressure of the keg. Rather than installing shanks on the back side of our boxes, we drill holes slightly smaller than the tubing diameter so that a tight seal is created but you can still pull the line into the cooler when not in use without tools. This makes transport & storage very convenient. You will need to purchase the appropriate keg connections for your needs, be it commercial or homebrew quick disconnects. You will also need a CO2 system to push the beer out of your kegs. This might sound like a silly question but what is the best way to connect the beer lines to my ball lock beer out. The 3/8"ID seems like it is going to be lose around the ball lock out. Do I need a step down connector or something here? What is best practice for this? I was planning to put on the white plastic QDs but same size issue. BEST ANSWER: Hello Russell - That's a great question, D1883 may be just the product you're looking for. The 5/16 barb end will work to pair with 3/8 tubing. Then you're down to 1/4 for quick disconnects and easy connection to ball lock bev out posts. What are the dimensions of this jockey box? BEST ANSWER: Approx. 24" Wide, 18" Tall, and 18" Deep. Bought this for use in festivals, works great. However make sure you tighten down all the connections, etc before use. I found all the small leaks the hard way when I got it up and running just before the first festival I used it at. Not too heavy to lug around, but sturdy enough that I suspect it will last a very long time with regular cleaning/maintenance. I have been using it for almost a year now with no problems after initial setup. Out of the box, make sure all connections are tightened down and test your system for leaks with kegged water first to avoid losing any precious beer! I purchased this a few months back to make lugging my kegs of beer around a little easier to serve. The unit came fully assembled. I ran cleaner and sanitizer through before first use. This helped me find out that not all of the clamps were tightened during assembly. I used this two times and noticed during setup the third time that the clamps were rusting! Seriously? Invest in some better clamps. 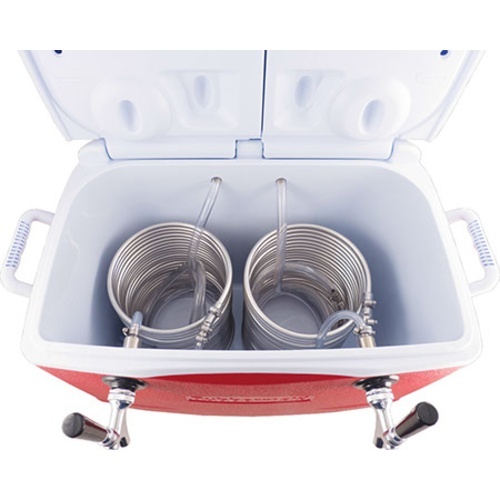 Another con would be the use of clear tubing from the keg connections to the cooler. Other than those two cons, the unit is pretty nice. Makes serving beer easy. Takes a little practice to get the pours right as well. This jockey box works great! I also am impressed with the price. It doesn't make sense to build your own with an offering like this. This box has proved to be a rock. Adding 20 pounds of ice the beer poured cold for almost 8 hours (I ran out)and is easy to clean. I've told others in the club to check out the Jockey Box at MoreBeer. Great product. 6 years running so far! I have used this thing to push as much as 60 gallons over a weekend and other than cleaning the lines properly and replacing a hose clamp this thing has been a work horse!